In Putaruru, they took to the streets at the local Water Festival last weekend in order to drum up some interest for lessons at the local club. When Jane Stearns is around – dressing up seems to be de rigueur. 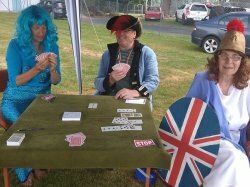 So we were not surprised to see photos of Cap’n Ross (club president Ross Provan), lost mermaid (Jane Stearns) and rule Britannia (RBM Eunice Eccles) cajoling interested locals to play some boards with them. Hope the initiative pays off Putaruru! National Director Allan Joseph is coming to the region to undertake a director training workshop for qualified/experienced club directors who are looking to take the next step to tournament directing. 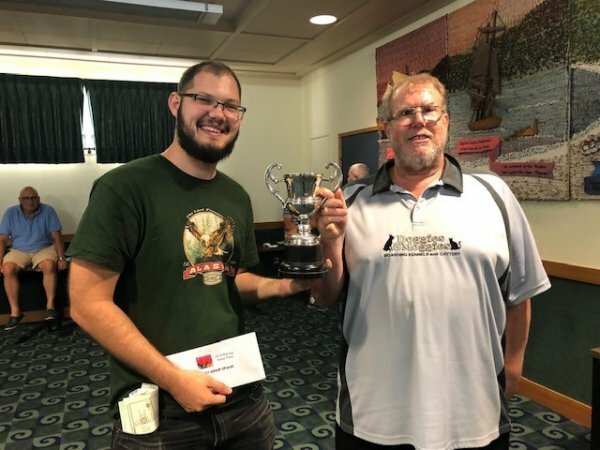 It is being held on Sunday 17th March at the Rotorua Bridge Club and further information/registration is on the tournament tab of the NZ Bridge website. If there is room we will also take registrations from interested directors outside the region. Make a weekend out of it and enter a team into the Kelly Peirse teams on the Saturday! Steve and Andi Boughey,Tania and Matt Brown....a champagne day at Tauranga? Certainly a "gin day! 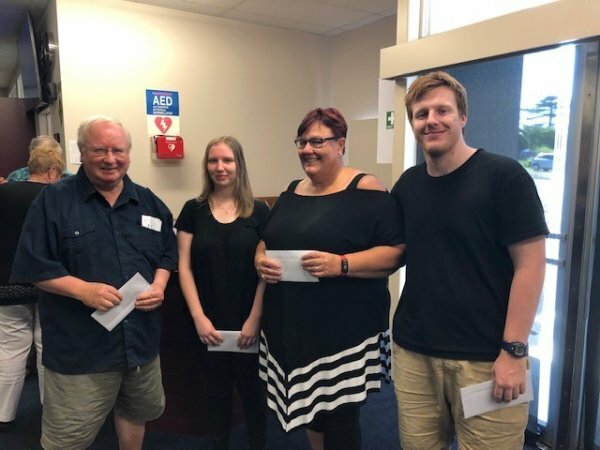 Some of the more successful exponents of intergenerational bridge were on show at the Tauranga Congress over the Anniversary Weekend. Winning the glamour 10A teams were dad-daughter combination of Steve and Andi Boughey who teamed up with Andi’s fiancé Matt Brown and his mum Tania. In second place were Charles Ker, Alister Stuck, Malcolm Mayer and Jonathan Westoby a mix from Central Districts and Akarana team...and not related to each other! Mum, Tania was perhaps the overall winner from the weekend. Not only did she get to spend some quality time with her son … she and Matt came third in the 10APairs, then the won the 10A teams AND THEN she went and won a bottle of gin in the raffle! Which was quite prophetic as when they were playing in the team finals, I overheard her retort that ‘a gin would be nice’ when offered water refreshments. While not wanting to put too much pressure on the young stars … there are high expectations for the next generation of "BouBro’s". 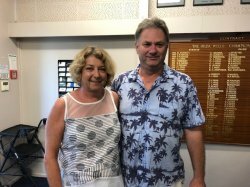 The 10A pairs event preceding the teams was won by Tauranga’s Jo and Sam Simpson who also managed to make the cut for the Team finals with Mike and Viv Cornell (but eventually finished 4th). Neil Stuckey and Barry Palmer from Auckland were runners-up in the Pairs. 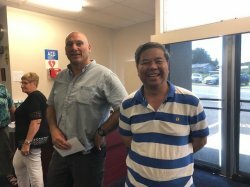 Moss Wyllie from Invercargill teamed with Gary Chen from Akarana to take out the 3A consolation pairs at Tauranga. And no, I don’t think Gary is smiling in appreciation of Moss’s victory joke. Top marks to the organisers of both the Thames and Tauranga mini-Congresses held during January. The tournaments were well supported with good reason – excellent catering and the scoring and events seemed to go without fault. At the Thames festival a few weeks earlier in January, the John Eldridge Teams event was taken out by Team Dolbel of David Dolbel, Tom Jacob, Denis Humphries and Malcolm Mayer from Auckland despite a small loss in the final to another Auckland team of Gary Chen, Jeter Liu, Fuxia Wen and Ian Berrington, they carried forward enough VPs to take the overall win. 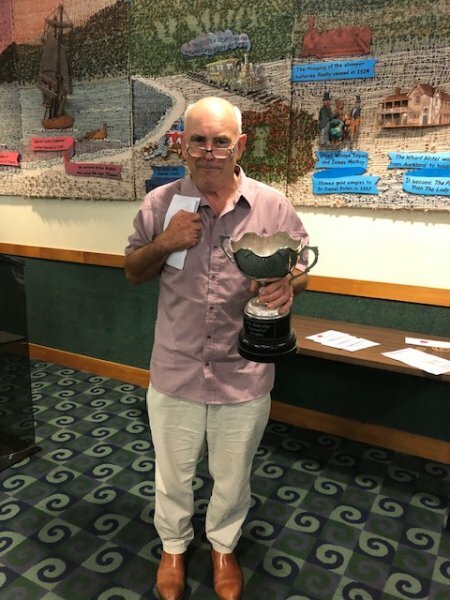 David Dolbel was stranded in Thames due to car trouble so was the sole team member who remained to collect the spoils at the prizegiving on the Sunday but managed a pic of Tom Jacob and Denis Humphries at Tauranga. David Dolbel... stranded but with the trophy! 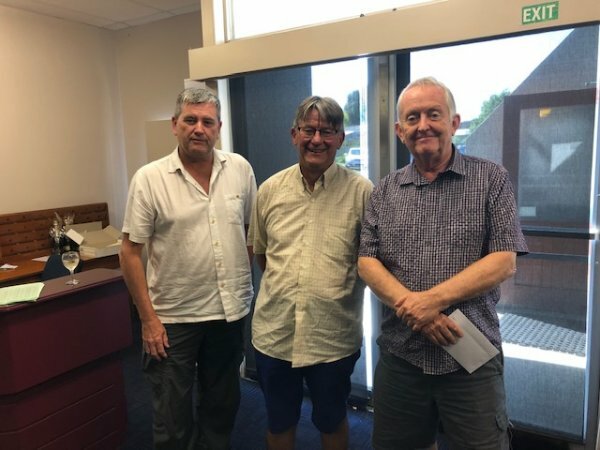 The Allan Barclay Swiss Pairs at Thames was a popular win for Paul Carson and Bill Humphrey from Auckland and Kerikeri who despite a loss in the last round had done enough to take the overall honours from Grant Jarvis (Franklin) and Pam Livingston (New Plymouth). Unfortunately not all children take to bridge as swimmingly as the Brown/Boughey clan. I’ve started my 11 year old on bridge with lessons last year and have dragged her reluctantly along to a couple of club sessions over the summer break (using the threat of losing her iphone privileges managed to do the trick.) 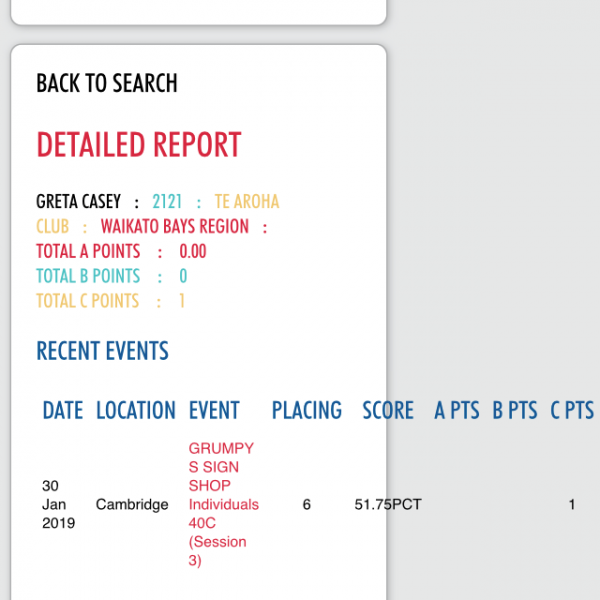 We did however achieve her goal (or maybe more correctly should be achieved my goal) of obtaining her first C points by the time she went back to school … In fact, she now has exactly 1 C point gained in the aptly named “Grumpy Signs” individual event.